SEOPressor / Blog / SEO vs. PPC: Which Is Better For Your Business? 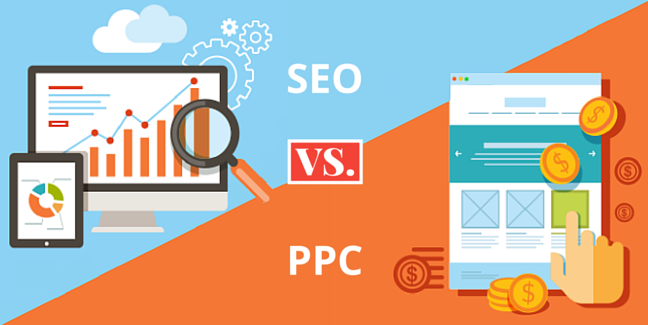 There has been a roaring debate over the use of SEO (Search Engine Optimization) versus PPC (Pay Per Click) advertising and which one provides better value for your online marketing. While those in one camp or another are obviously going to have their opinions on the matter, there are a few research done to compare both of these. Here in no unfiltered terms, is our analysis of the debate between the two marketing arms. Firstly, let’s identify both of the differences. Clients these days are likely feeling the push towards the Internet and away from more traditional means of advertising… for good reason, of course. According to Jupiter Research, it shows that an astounding 81% of consumers are going to use search engine results to determine their purchases. Imagine ignoring more than 3/4 of your audiences by not engaging in online marketing; the repercussions are sobering. But many businesses don’t appreciate the distinctions between organic search engine results and paid search engine marketing. That is where the distinction between SEO and PPC come into play. 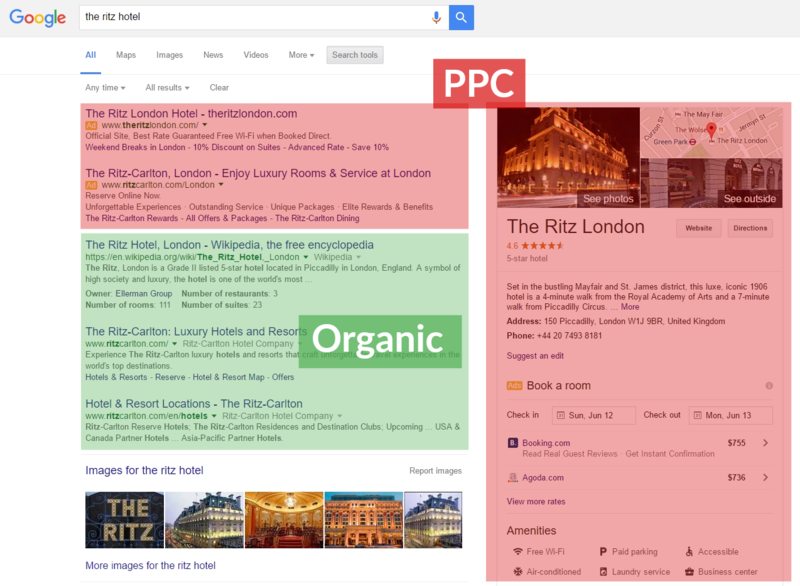 Here’s how you can differentiate between organic traffic and PPC on Google results page. SEO marketing brings a synthesis to your website’s content and draws visitors in through the main channels of search engine results. If you are a psychiatrist in Pittsburgh or a plumber in Piscataway, you will want your business to come up in the first page of organic search engine results. You’ll stand a higher chance to get more traffic for your site when you’re in the first page of organic search engine results. Appearing on the first page of Google can also ensure that your traffic comes from the visitors who want your product or people who have been seeking out your service. That also means that your organic search engine optimization is poised. PPC advertising, on the other hand, is a little bit different. These are the “sponsored ads” which run alongside your search engine results and will change from search to search. For example, if you pull up a search engine search for cycling shops in Portland Oregon, you are going to find many of the most popular SEO results in your main search. But along the side of the search, you’ll find sponsored PPC ads that only unlock value for the host if there are click through to the websites along the side. 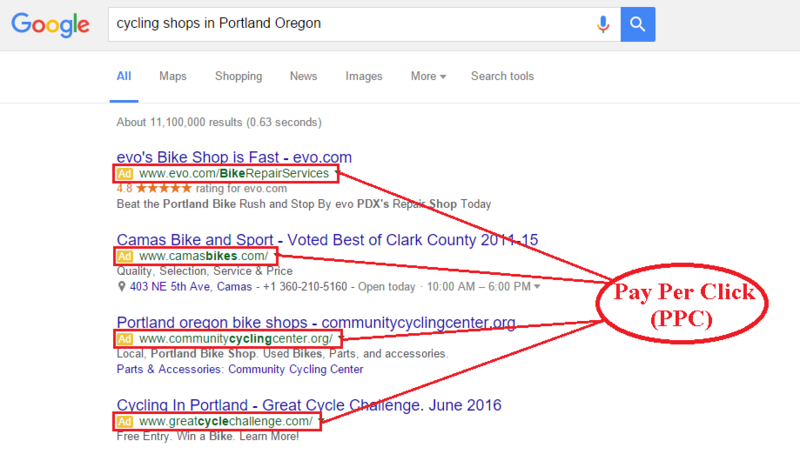 Although it appears at the top of Google page, but this doesn’t mean that you are going to find the “best” or most relevant cycling shop in Portland Oregon in the PPC lane. In fact, many times, the PPC ads that you find are from new entrants into the field, those who have been untested and those who are desperately seeking exposure. Of course, there are also occasions where the SEO and PPC results may look very similar. This may be because, in this example, the most prominent cycling shop in Portland Oregon has also cornered the PPC market and has deployed itself into both realms. How Do SEO And PPC Help Your Business? As we discussed earlier, the uses of SEO and PPC are quite different and the research spells that out. Let’s say you are a new entrant into a market and you are trying to establish yourself in the market through effective search engine results. The quickest way to do this is through the use of PPC advertising, but is it always the best? An article by Moz seems to tell a different story. Organic SEO results from a search are 8.5 times more likely to be clicked through than a PPC sponsored link. 8.5 times. That’s huge. Consider your own search engine behavior. When you seek out any type of information from a search engine, what are the first things that you click on? A great majority of us would probably say that we click on the organic search results before we would click on a paid link to the side. So even though building up organic search engine results through optimized content that users will seek out may take a little longer, the facts remain clear. Your business is 8.5 times more likely to get the customers and the results you are after if you use legitimate organic search engine results. If the numbers are truly so staggering in favor of SEO advertising, many people may ask then why anyone would do anything differently. The question is not about whether SEO or PPC is more superior, but more to which is appropriate for your website. If you are new to the marketplace and you are trying to introduce yourself and your product to a new audience, PPC ads may be a good option for a limited release. You don’t want to stay there for too long but if you have an introduction and you are trying to elevate yourself to the top of search results quickly, this is a viable option. Are you running a limited-time special offer? If that’s the case then you may wish to zoom your ranks to the top of the PPC results. You are not going to get nearly the traction you would with organic results but many advertisers swear by the PPC metric for limited time offers. If you already are at the top of all the organic SEO results and you are simply trying to elbow your competition out of the market then using PPC ads can’t hurt. Of course, you are going to have to pay for this individual click through but if your dominance in the marketplace is already so huge, then use of PPC will only further embolden your spot in the market. The final metric to your preference of PPC versus SEO may just be ignorance. If you didn’t know the dreadfully low click through rates of PPC and you thought that you were doing your business a lot more good, then you may use PPC. 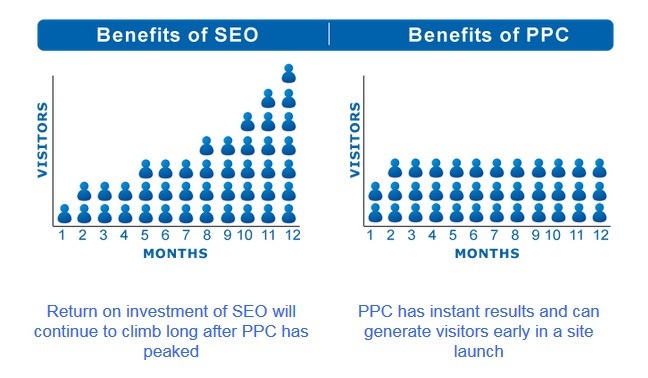 However as the research continues to show, PPC is a vastly inferior platform to use when compared against SEO. While the research and results have shown to be far superior for one over the other, consider your own search engine searches and the results that you prefer. Seeking out and finding what you are looking for through search engine trolling is far more laborious task, but the end result is vastly more satisfying. As you can see, SEO enables you to build a trusting relationship with your customers compared to PPC. When you hit upon that retailer, that undiscovered corner gem bakery, that earnest lawyer or doctor or that delectably romantic restaurant, you don’t ever forget it. These are retailers who have a solid online presence and offer a service to their customers that simply can’t be matched. So is your SEO results. The fact is that most of the time when you click through PPC ads they don’t “quite” fit. Broadly speaking, the PPC results you click on may be similar to what you were looking for or kind of in the same neighborhood, but when you drill down deeper, the end result isn’t nearly as satisfying or as correct for what you were seeking out. If you do push through and use this retailer that you have found through a PPC ad, you may be surprisingly satisfied! And that’s great.. because that may instigate you to continue to use PPC ads. However, more often than not it’s these non-organic, broadly targeted ads for goods and services on the periphery for what your search was about which fall flat. Your business will definitely do well if you invest the time and energy into creating SEO advertising that targets your audiences. There are also case studies that have proven SEO is better than PPC, so there’s no need to worry about it. Although it may take some time to see your SEO effort, but it will be worth it for your business. 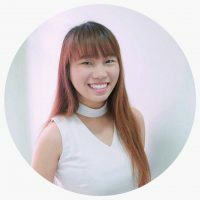 PPC is fast, but how long will it last? Remember the vast scope and inevitable limitations of your business, remember that your local customers still want the local, targeted service you provide, and your online SEO marketing will be so much more successful than you could ever have imagined. Other than optimizing your website for a better SEO manually, you can also use the WordPress SEO plugin to help make things easier. 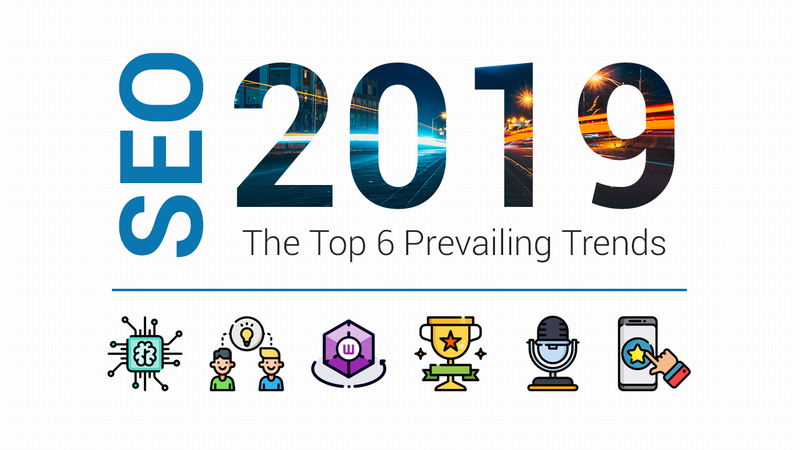 Here, we use the latest SEOPressor Connect to optimize our on-page SEO effortlessly and get a better ranking. Which is your preferred strategy for your business, SEO or PPC, and why? Do share it with us in the comment section below. We’d love to hear from you! A must-have checklist for every beginner to start your SEO journey.